I'm sure a lot of parents have faced the struggle of not having enough hands. Well when trying to convince Gracie to hold my hand to keep her safe whilst I try to push the buggy, I could really do with that third hand!! So when the lovely people at BuggyTug said they were looking for people to test the ToddleTug I jumped at the chance. 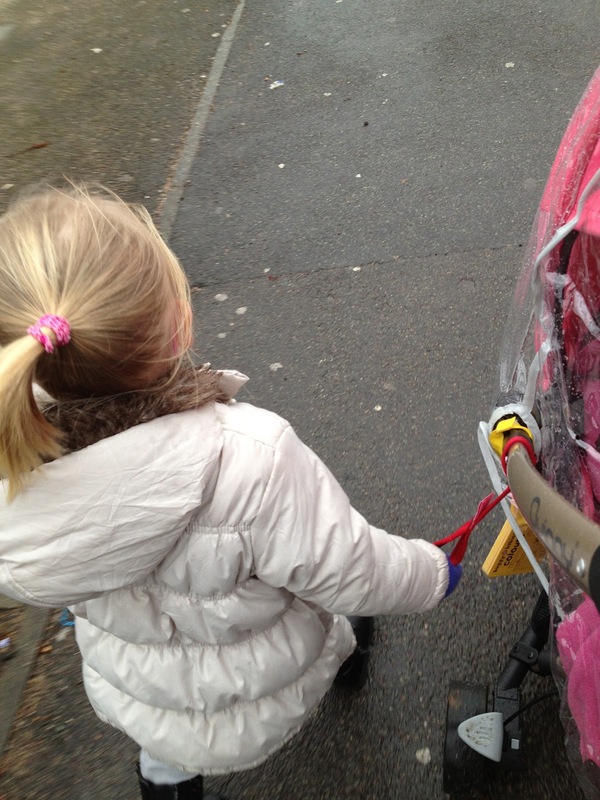 Gracie is now a fully fledged independent toddler who thinks that she doesn't need to hold mummy's hand any more, so much prefers to hold on to the frame of the pushchair, well most of the time. The problem with this is that she ends up tripping over the wheels of the buggy or finding herself having to stretch to reach the frame to hold on. That is where the ToddleTug comes into its own. It is a simple yet very effective product, a long red strap that has a metal ring one side and a handle the other. All you need to do is wrap it around the frame of your pushchair and slot the handle through the metal loop, easy peasy. I wish it had been around when my other children were younger. It means that Gracie no longer trips over the wheels of the pushchair, she doesn't have to outstretch herself to hold on because the ToddleTug remains at her level and because the material it is made from is stretchy, Gracie can feel like she is walking by herself without being away from me. The only snag I found was that I like Gracie to walk on the side of me that is farthest away from the road, which meant swapping the ToddleTug to each side of the pushchair when needed but it so easy to do that it really is a minor problem. Priced at just £3.99 I would be happy to purchase two to have one either side of the pushchair. You can also purchase BuggyTugs and TeddyTugs in their shop for the same price, or if you wanted they also sell the TugTrio which is one of each strap for just £7.99. Disclaimer this ToddleTug was sent to me for reviewing purposes, all opinions are my own.